The helicopter landing pad and crane barge CHIRYU in Tilbury . RWJ? Off the top of my head this would have been around June 1990. 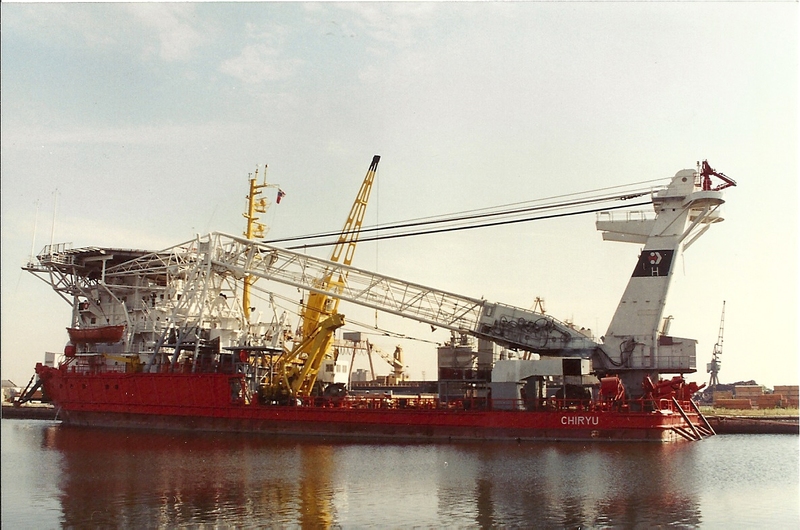 I was appointed as Superintendant Engineer after the vessel had been purchased by Cable and Wireless Marine. We laid over there for almost three months preparing the vessel for later conversion on the Tyne where she was lengthened, widened and extensively updated for worldwide subsea construction projects. On completion of her conversion she became the Norlift. The crane had a capacity of 300 Te and manufactured by Liebherr. I stayed with the project from purchase June 1990 until final sea trails February 1992. Challenging would be an understatement but gained an enormous amount of knowledge.